How would you like to have a see-through house with no privacy and no place to hang your favorite velvet painting? Well that’s too bad because you could save a lot of money. But now that we’ve established that you’re a traditionalist, you’ll have to face the reality of adding drywall to your house building project. 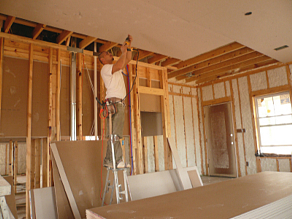 Drywall is a gypsum-based board product with paper backing that serves as the finished wall surface in the overwhelming majority of modern American houses. Hanging and finishing of drywall is done immediately following the rough-in of all mechanical systems ─ plumbing, HVAC, electrical, security ─ as well as insulation or anything that will be hidden in a wall cavity, and after each of these has passed all applicable inspections. 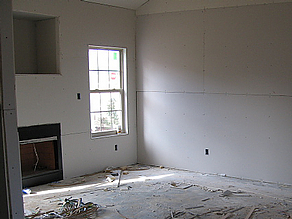 Drywall is most commonly used at a thickness of one-half inch. Some building code applications call for five-eighths inch in particular places. Most commonly used widths are 48” and 54” (used for houses with 9’ ceilings to minimize waste) with 8’ and 12’ lengths most common. The drywall job has three stages: hanging, taping and mudding, and sanding. The “mud” is applied in multiple layers with drying time needed between layers. The entire process should take from five to ten days, depending on size of the house.